To compete in the API economy, organisations need to create winning API experiences for employees, suppliers, customers and consumers. In today’s increasingly interconnected world, application programming interfaces (APIs) are becoming the digital reflection of an organisation. To differentiate themselves in a highly competitive market, companies need to create digital capabilities for end users as well as API experiences that set themselves apart in the minds of developers and the organisations they support. They also need to manage their APIs as they do other products and services. This requires a commitment to addressing the external API “look and feel” as well as developing an infrastructure that supports the API lifecycle from inception to retirement. So what are the business drivers for the adoption of API’s? API Connect is a cloud-based API management solution that is designed to make your job easier. You’ll find simple coding, self-service developer portals, real-time analytics and built-in security. With fast provisioning in the cloud you can be productive straight away. Attract and engage developers through API socialisation with enterprise governance built-in. 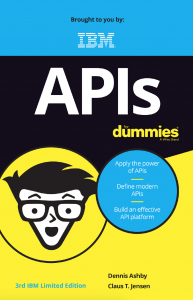 Download the API for Dummies book for FREE! Want to get started with API's? Get in touch with the online chat facility or fill out the form below.